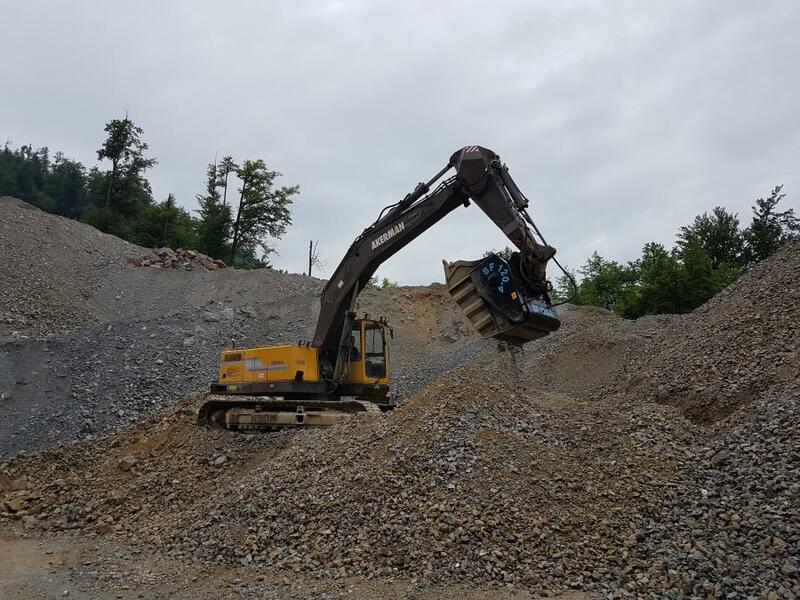 At the construction site of a new artisanal / industrial area, the BF90.3 crusher bucket is crushing the rock material accumulated during the leveling project of the 14-hectare area. In some photos, the bucket is set to 10 cm, in others to 3 cm. The material is thus easily reused in the same building site, the surplus is sold to third parties. Tangible and genuine solutions. This is the most common desire of professionals and companies that are involved in construction services, demolition, roadworks, earth moving, industrial and urban development, trenching, excavations and tunnels, environmental reclamation in every part of the world. Those who know the basic requirements for any construction, excavation and recycling job site, are familiar with the commitment towards the job, the customers satisfaction and deadlines that each contract involves. For more than 15 years MB Crusher's mission has been to boost work, improve productivity, make companies competitive and to tirelessly win. Tireless, is the perfect word to use, to describe MB's crusher buckets, that allow you to work non-stop for decades as the gears remain healthy with a simple few minutes of greasing, according to the manufacturer. Everything processed onsite with zero extra expenses is the MB motto: crushing of any inert material onsite, with no transport, disposal or rental costs. For those who want to take full advantage of direct onsite processing, the MB crusher buckets are ideal tools. By avoiding the need of specialized technicians and the purchase of multiple spare parts, maintenance costs also have been reducedto almost zero, the manufacturer said. For the past 10 years, the BF120.4 crusher bucket has been the only crusher in this quarry where it reduces Dolomia rock (Dolomite) for all construction projects in the area. After all these years, the only more substantial maintenance intervention was the belt replacement. 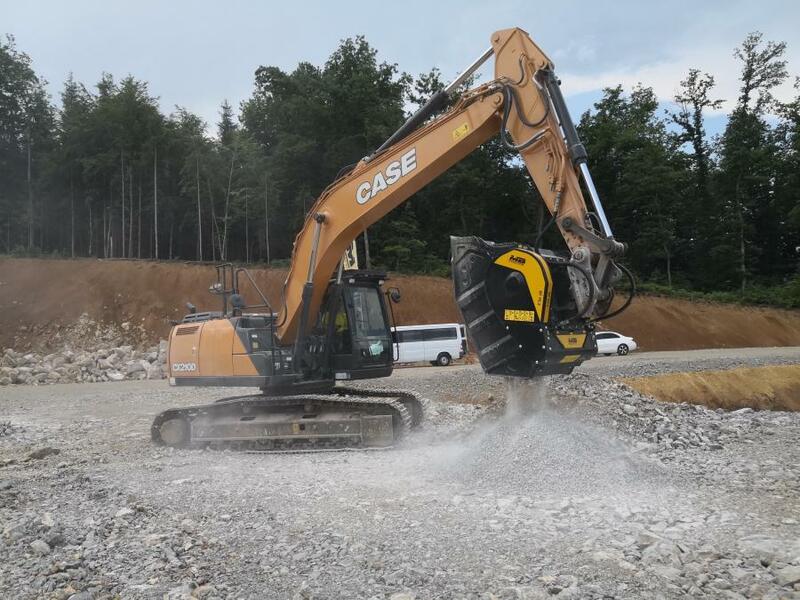 "I can testify that we receive calls from company owners, excavator operators and project managers from all over the world, every day," said Guido Azzolin, sales director. "We assist them by analyzing the costs of maintaining the old, adding the new. The increse of production and profitability. that follows using the right attachment to optimize all inert material for the project at hand. This while taking into consideration the company's goals and local restrictions. "There is a reason why we offer the widest range of crusher and screening buckets in the world: Our ‘first edition' units aren't ‘disposable', when we release the latest version. Our equipment continues to evolve from patent units, so already advanced, tested and appraised machinery. We improve everything that research suggests, while maintaining the quality that lead us to the top of our industry: our excellent on-site crushing, simplified operations, long life, competitive costs. "We also take pride in our customer's use of the attachments, by publishing their videos on our YouTube channel. Where they show the efficiency of MB buckets in use after many years or the exceptional productivity of the newer models that become instantly part of the work process ." Non-stop operations and high profitability is MB's promise to all customers who want to increase their work load without modifying their excavator. From simply applying grease, exchanging jaws or installing a new bucket, all operations are done quickly with no time wasted on learning new settings or by attending courses or training sessions. All the profitability of a real crusher is immediately obtainable on site. MB has agents and distributors all over the world who are ready to offer fast and free information, live demonstrations and around the clock assistance. Customers can contact the company by phone or by accessing their websites chat, to set up a demo, order parts or even to try a bucket to test its efficiency. MB has been known for more than 15 years in the world of crushing, demolition and recycling.